From the team behind the popular corporate finance website, Vernimmen.com comes a concise guide to the subject, presented in an easy-to-use, highly accessible "question and answer" format. An essential reference for students of corporate finance and practising corporate financiers alike, Frequently Asked Questions in Corporate Finance answers key questions in financial engineering, valuation, financial policy, cost of capital, financial analysis, and financial management. Covering both the theory and practice of corporate finance, the book demonstrates how financial theory can be put to use solving practical problems. What advantages are there to a business looking to spin off its divisions into subsidiaries? Is there a formula that can be used to determine the change in normalised free cash flows? What are the possible reasons behind a share buyback? What are the pros and cons of off-market share buy-back? 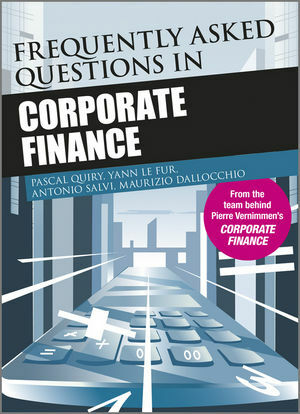 Filled with the answers to all of the most common, and not so common, questions about corporate finance, the book presents authoritative, reliable information from a respected team of experts from the banking, corporate, and academic worlds. Pascal Quiry is a professor of finance at the leading European business school HEC Paris, and a managing director in the Corporate Finance arm of BNP Paribas specializing in M&A. Maurizio Dallocchio is Bocconi University Nomura Chair of Corporate Finance and Past Dean of SDA Bocconi, School of Management. Yann Le Fur is a corporate finance teacher at HEC Paris business school and an investment banker with Mediobanca in Paris after several years with Schroders and Citi. Antonio Salvi is Full Professor of Corporate Finance at Jean Monnet University, Italy. He also teaches corporate finance at EMLyon Business School and SDA Bocconi School of Management. Pierre Vernimmen who died in 1996, was both an M&A dealmaker and a finance teacher at HEC Paris. His book, Finance d’Entreprise, was and still is the top-selling financial textbook in French-speaking countries and is the forebear of Corporate Finance: Theory and Practice.